WELCOME TO THE GREEN GECKO - ASHBURTON! Fully furnished including linen, full kitchen & cleaned by us. 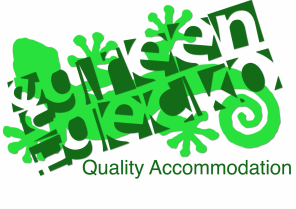 Green Gecko Holiday - 4 BR sleeps 7. Green Gecko Apartment - 2 BR sleeps 5. Meg's Place - 4 BR sleeps 7. For larger groups combine all three to sleep 19 guests. Fully furnished accommodation in Ashburton. Everything is provided just bring your food, enjoy your stay and we clean up afterwards! Short walk to shops & cafe. Offers everything that you would expect from a motel/hotel but with the bonuses of space and privacy positioned away from the main street and railway in a quiet family friendly suburb of Allenton. "Had a very nice stay, plenty of shops within walking distance and a very cosy comfortable house." - Leah, Australia. Warm & Comfortable - Our holiday home has undergone extensive renovations (including extensive insulation) and been outfitted with new decor offering visitors to Ashburton a warm pleasant, clean, fresh and spacious alternative. Heat pumps and HRV system. Conveniently located - Your accommodation is located less than 50 metres from the Allenton Shopping centre offering guests the convenience of a Four Square, Medical Clinic, Pharmacy, Dairy, Service Station, Cafe, Fish & Chip, Butcher and more. A 15 minute walk or 5 minute drive into Ashburton CBD where several Cafe, Restaurants and Bars are available for wining and dining. All the large chain stores and fast food outlets are centrally located in Ashburton. Your accommodation is only 7-800 metres from the new EA Networks Sports Stadium, The Domain and Ashburton Hospital. The Domain is a large wooded park with well established fauna, a bird aviary and large modern childrens play ground and paddling pool. If that is too far to walk the "Hidden Park" a small grassed area is a short stroll around the block from base. There's lots to do in Ashburton - check out our "Things to do" page for holiday ideas! Accommodation Ashburton - The Green Gecko Holiday Home, Ashburton, NZ.